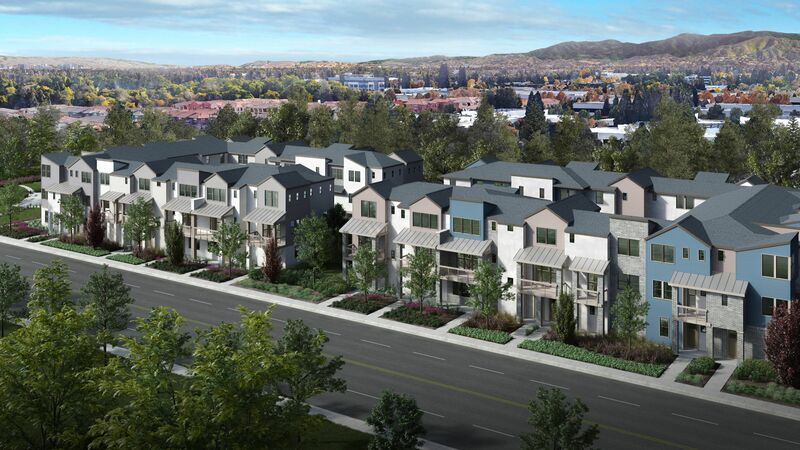 Nova of Sunnyvale will feature 136 brand new attached townhome-style condominiums on more than 5.3 acres within the master planned community, The Vale. With seven different three-story open floor plans, these homes will range from approximately 1,194 to 1,907 square feet, with 2 – 4 bedrooms and 2.5 – 3.5 bathrooms. The master plan encourages an active, social lifestyle with parks, landscaped paseos and a community building on 25 acres. Residents will have access to first class amenities that include The Nucleus, a spacious, modern and welcoming community clubhouse with stylish outdoor areas that are perfect for catching up with friends or spending some relaxing time to yourself. The Nucleus is filled with art, upscale seating and finishes. There’s also a beautiful community garden and expansive meeting room perfect for birthdays, anniversaries, dinner parties and more. Residents will also enjoy the large community park with a half basketball court, workout stations and barbecue grills. Nova at The Vale is in a premier location for any homeowner. Located in beautiful Santa Clara County, Sunnyvale is one of Silicon Valley’s major cities and is the seventh most-populated city in the Bay Area.